Back when we withdrew Matthew from private school, if you had asked me, "How does your kid learn?" I'd have said, "I have no clue, but I can say that whatever he's doing in school isn't working." I think we've tried nearly every "method" out there in the last three years. It seems that video-based vs. read-the-textbook presentations have been better for him, but when it comes to literature, there's really not a way to get around reading the book. After a lot of trial and error, we've found that Jude has really taken to a classical style of learning; he responds well to the structure and pattern of the style. 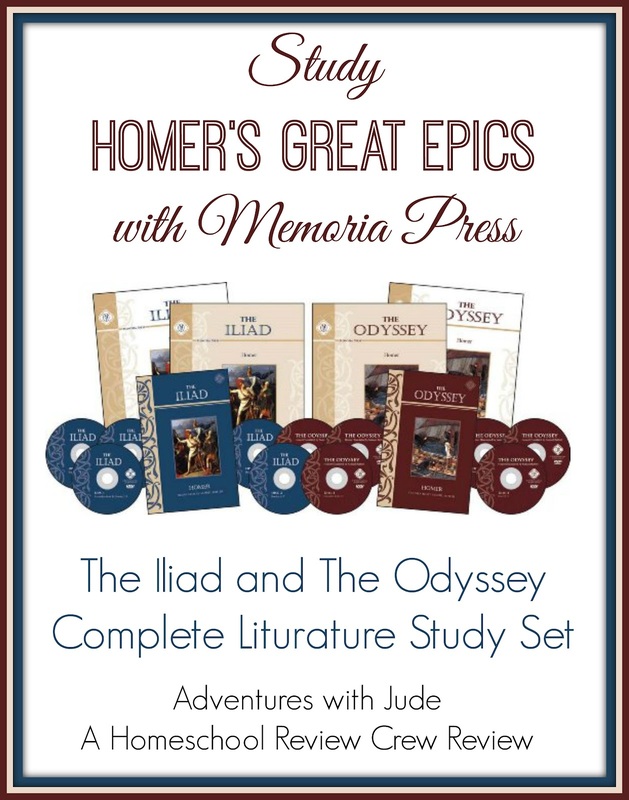 Memoria Press has become a favorite of ours for literature studies, and we were given the opportunity for Matthew to work with their Iliad and Odyssey Complete Set. This package contains a copy of the literary work as translated by Samuel Butler, a Student Guide, a Teacher's Guide, and a DVD lecture series set for each work. I decided it was worth trying. With luck, it would turn into a credit-worthy literature study; at worst, we'd know that this style wasn't for him. Our plan was to begin with The Iliad and then eventually move on to The Odyssey if the first program worked for him. I skimmed ahead to be able to review the series, but in the interest of him keeping plots straight, he stuck to one program. I suppose since he and Jude are very much alike, I shouldn't be too surprised by how well he's taken to Memoria's style, but since literature studies have been a nightmare for him, I wasn't sure how well it would go. 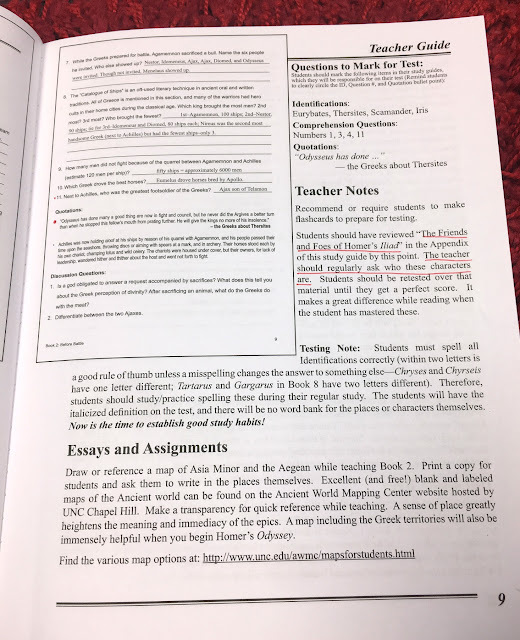 This particular program combines the literary work, a Student Guide workbook, and a video lecture that helps explain the highlights, lowlights, and important points of the story. Memoria Press recommends this program for students in grades 7 through 12; I think most students, especially older high schoolers, could do this study with minimal parent assistance. However, although Matthew is in 10th grade, he isn't "most" students. He has pretty severe ADHD and needs very frequent redirection. I've sat with him to work on this, partly because it was a review program, but mostly because I wanted to make sure he was fully engaged in the lessons. He has done well with the routine and structure, but still sometimes needs guidance staying on task. The Iliad (and The Odyssey) is divided into "books" rather than chapters. Instructor Sean Brooks explains during one of the videos that this is because the original epic was not divided into chapters, but was too long for a single scroll. The story was broken into what fit on each scroll, with each scroll being called a "Book." Memoria Press uses a translation by Samuel Butler, and each Book is about 15 to 25 pages. For Matthew, that's a lot of reading at any one time. When we first started reading, based on his answers in the Student Guide, he obviously was merely flipping pages and not absorbing anything. I know Jude and Damien understand books more readily if they are read aloud. When I need to be sure that they are actually reading and not skimming, I make them read aloud, but sometimes it's better if I read aloud because then they can focus on the content and less on the decoding. We began reading out loud, taking turns with pages, until I realized his reading skills are not what I believed they were. I began doing all the reading so he could focus on content. After three books of reading aloud, he started reading on his own, because he wanted to know what happened next and he was tired of waiting for me. (He works independently earlier in the day, while I'm helping the younger boys, and then we tend to work later in the afternoon or into the evenings.) I think once he got into the story, he realized he was beginning to enjoy it. Based on the answers to his questions and discussing the book with him, it's clear that he's reading for content, not just to say "Yeah, I read it," and has barely skimmed the text, and he's retaining what he has read. We've continued working together with the DVD lecture, but, after reading aloud from three or four books each day for the younger boys, my voice appreciates being able for each of us to read quietly. I must admit, though, after the first few books, I'm eager to find out what happens next. I think the video has made a real difference for Matthew in what he's been able to understand. The lecture series is divided by the corresponding books, and each one runs about 30 to 45 minutes. It usually takes us closer to twice that to work through a video, because he's often stopping to take notes (he can't write and catch the next bit of information), or stopping to underline key passages in his book. Mr. Brooks does a thorough job of explaining the story, helping to clarify not just the "what's going on," but the why and the back stories of the culture. As Matthew takes notes and highlights passages, it's definitely helpful that he isn't jumping back and forth with ideas. Additionally, there are pen-and-ink drawings interspersed through the book. Often when discussing a passage, a nearby illustration appears on the video screen. Matthew and I both appreciate this because it helps give a visual cue of where in the book the discussion is focused. Matthew isn't wasting time trying to figure out where in the story the discussion is, and then trying to go back and forth between book and video. Rather than leaving Matthew to try to figure out everything from context clues, it has been a benefit for him to have a teacher pointing out key ideas, passages, events, etc. I think the video lectures have made a big difference in how he has learned to like the story. He's been working on another Memoria Press literature study (Poetry and Short Stories: American Literature) and asked me if there was a video to go with it. I wish there were! I definitely notice a difference in his ability to connect ideas - once he has been given one concept from the lecture, he has been able to find that repeats of it relatively easily, because he understands how Homer presents that idea. 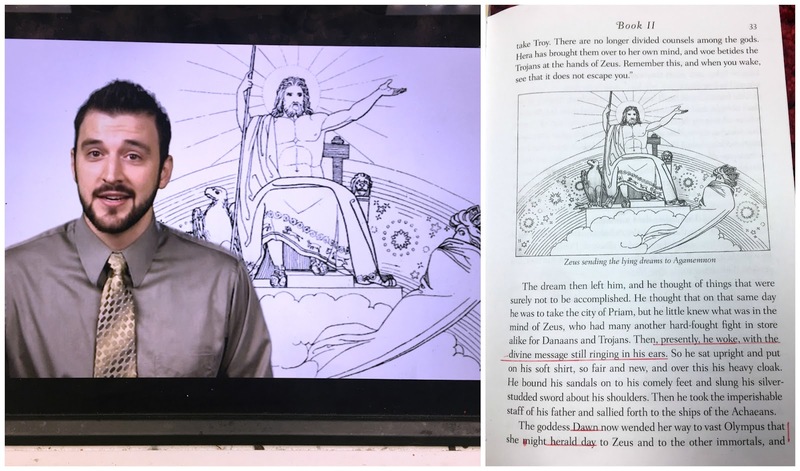 Even though he wishes there was a video guide for that study, he has gotten better because he's gained confidence in his ability to discern ideas from the text. He's starting to pick up ideas from The Iliad, and when they are confirmed in the video, he visibly puffs up that he got it. I think it's allowing him to let himself try with the other study -- he doesn't feel like he's completely inept. 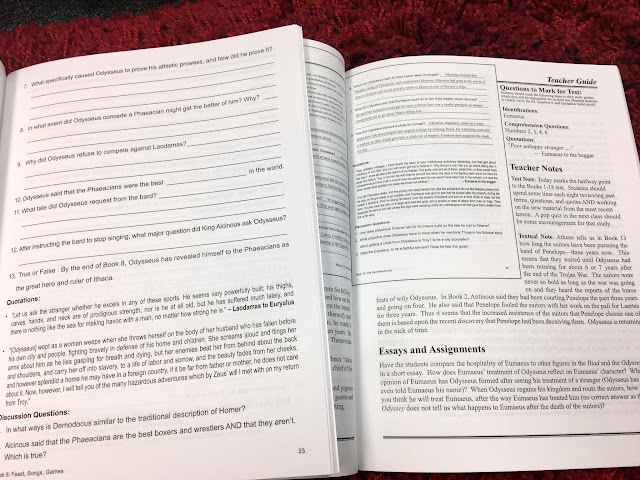 The Student Guide workbook contains a lot of guidance for learning beyond the questions. Principal characters in that specific book, specific quotes, and both comprehension and discussion questions are part of each section. Also, Appendix tables containing summaries of main characters, military vocabulary, etc. help the student understand the players in the story. As a parent/teacher, I appreciate the way the Teacher's Guide is arranged. It mirrors the Student Guide, so there's no flipping around looking for corresponding pages. There are notes to help guide discussions with the students, but also to help the students prepare for the included quizzes and exams. I think if you have a student that remembers lots of information and can sort through it easily when presented with an exam, then just reading/studying the Student Guide is sufficient. However, Matthew definitely needs help focusing. Knowing that there were ten characters in a book but only four that he'd have to know exactly who they are for the test helped him not be so overwhelmed. I appreciate being able to check his answers for each portion, and then saying, "Ok, now make your index cards, using question numbers 1, 4, and 9, and the characters <name, name, and name>. It makes studying for the cumulative tests (answer keys provided, thank you!) less overwhelming for him. I've been allotting about five school days for each book. On Day 1 and/or 2, Matthew reads the assigned book. On Day 2, we watch the DVD and take notes/highlight passages in the book. On Day 3, he does the accompanying questions in the student guide, which we review on Day 4. He then works on creating a study guide for characters, questions, and quotations that are pertinent to upcoming quizzes and tests. Day 5 has become a "what's left?" day; sometimes he's working on finishing the workbook/notecards; sometimes it has become a test/quiz/write essays day. If he's managed to get things done a little faster, he gets a day off. (There's motivation, eh?) In all, we spend about 5-6 hours on each book. In the interest of keeping his brain from exploding, we opted to do one work at a time. Therefore, since he hasn't gotten to working on The Odyssey, I read a little of the book, looked through the guides, and watched a few of the videos. I'm really looking forward to when we get to this one. 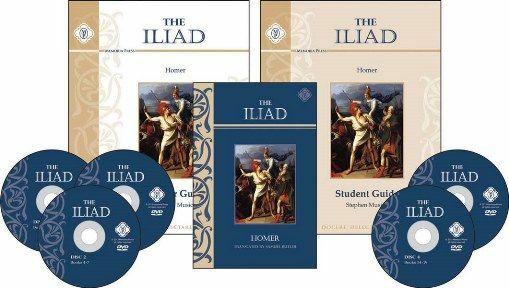 The guides and videos repeat the same patterns/content as those for The Iliad. 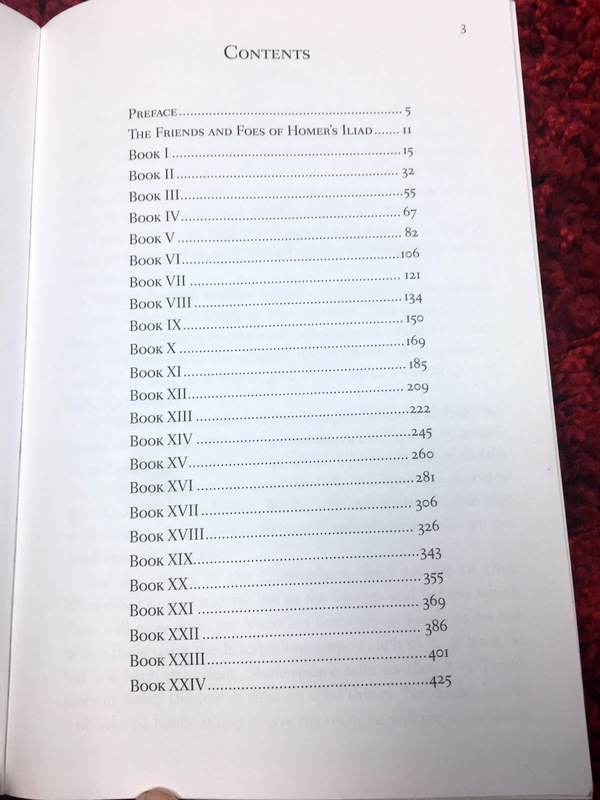 Although the set is "only" two literary works, between the material presented and the time/effort involved, I'm comfortable considering this set equivalent to a full literature credit for Matthew. Since he hs already nearly completed his 10th-grade literature course, I'm planning on continuing on with the curriculum and crediting it as Grade 11 literature. Having worked through the program for several weeks now, I really think that this particular program is better suited to high school students. After running several sections of the text through an online scorer, it averages to an 11th-grade reading level. While I think a younger student could manage the program, I think that just reading this particular translation/text with an average middle school/junior high student could be overwhelming. Celia is in 7th grade, and while she's an above-average reader, she's definitely not anywhere near ready for this! 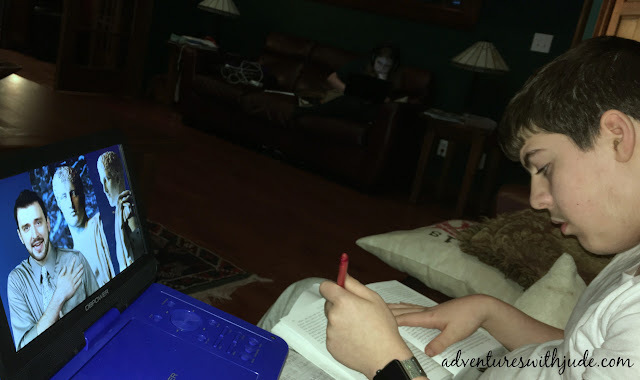 If she chooses to be homeschooled for high school, I would definitely consider this again for her as a sophomore or junior literature course, but I certainly wouldn't choose it for right now. The student workbooks are consumable, so to re-use this set with her, I'd need to purchase at least those items. We'd also need to buy another copy of The Iliad (and presumably, The Odyssey) since Matthew marked this one up with his notes. This isn't too much of a re-investment; the complete set costs $135, and re-purchasing the student's books needed would run about $48 for both. I know, $135 seems kind of steep, compared to the cost of just the books, but honestly, I really think the videos are crucial. I think these make the difference in the program from being "just another read the book" study. They definitely have helped Matthew, but I've even found them helpful for me personally. 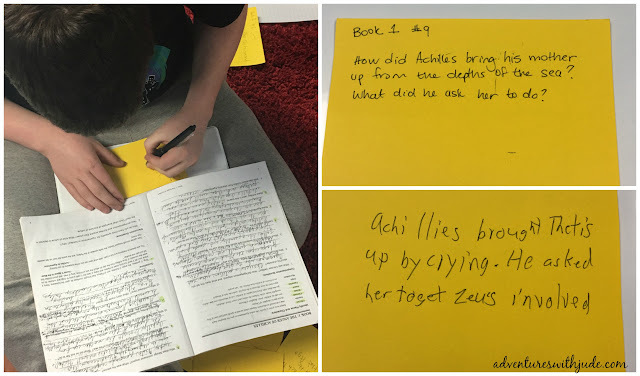 While I know the basic stories of The Iliad (and The Odyssey) from "picture-book-ized" retellings, I can't say I've ever said to myself, "Hey, why don't you sit down and read the full stories for fun?" The books are at times overwhelming, and Mr. Brooks even admits when there is something coming up that is going to be a bit of a chore to read. I think after Book II I'd have given up. However, the content of the lectures has really made them seem more accessible and enjoyable. These epics were originally meant to be recited as part of Greek history so there would be an understanding of glory, honor, and the role of the Greek gods. I think it's probably akin to the different between reading a Shakespearean play and seeing it on stage - it just is so much more understandable when it's not just words on a page. I wish Memoria Press had more studies like this! It's been interesting working with Matthew; upon learning about Achilles' weak spot, he remarked, "So...you can shoot him in the head or chest, and he's fine, but if he steps on a Lego, he's done." Having stepped on a few Legos in my day, I could only laugh and (mostly) agree. I asked Matthew what did he think of the program, and he said, "Pretty good." Thanks, kid...could you give me a few more words? He decided on, "I like it because the DVDs give me more depth on the Greek history. All I remember from history is the Trojan horse, so I kind of like learning about what happened before the horse invaded. I like that it tells me what's going to be on the tests, so I know what to study. I don't mind learning about other stuff, because it's important, but it's a lot to remember, so it's good to know what's super important and what's normal important. I think the instructor's pretty funny, too. He's not boring, and I feel like he really likes what he's talking about." I think we've finally found at least one program that will count for 11th grade that won't lead to tears on either part. I call that a win. 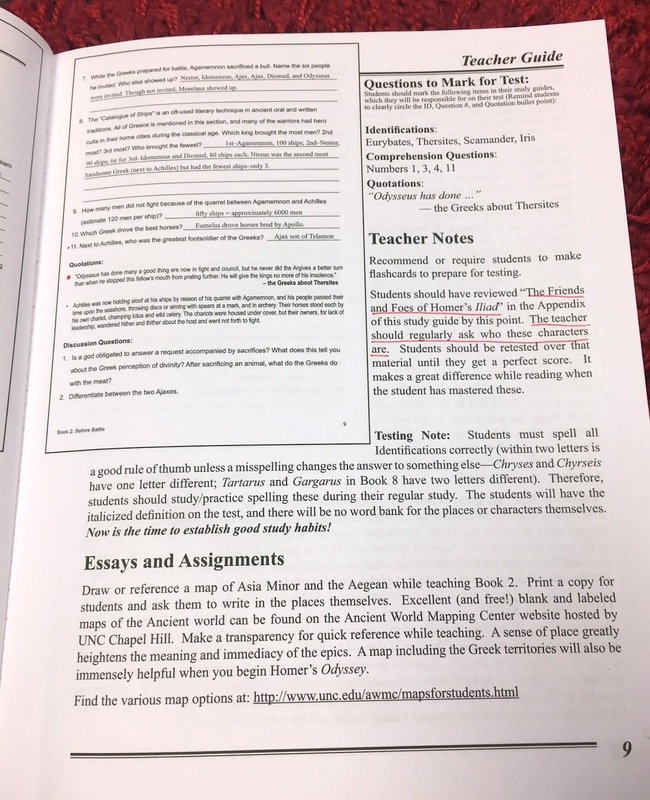 Crew members have been exploring three programs from Memoria Press: The Iliad and Odyssey (Complete Set), First Form Greek (Complete Set), and The Story of the Thirteen Colonies and the Great Republic Complete Set/200 Questions About American History Set. To read reviews of these, click the banner below.